Q: I finally rented “The Cove” and was disgusted and heartbroken to witness the slaughter of those beautiful dolphins. Since the movie came out, have things gotten better over there in Japan? 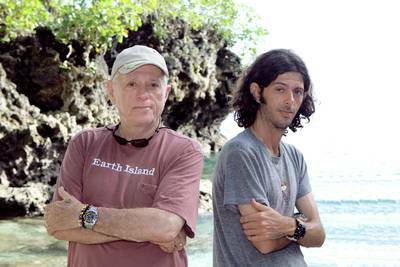 — Julia S., West Palm Beach, Fla.
A: I spoke with Ric O’Barry, longtime dolphin activist and subject of the award-winning documentary “The Cove.” He is sad to report that the slaughter and capture of wild dolphins still occurs, albeit on a “lesser” scale. You can track Ric and his son, Lincoln’s, progress on this hot-button issue on Animal Planet’s “Blood Dolphins.” The premiere episode airs Aug. 27 (with an encore Sept. 3), and parts two and three air Sept. 10 and 17, respectively. A: The versatile 67-year-old actor has many big-screen movie projects in the works, including “The Irishman,” “Life’s a Beach,” “A Girl and a Gun” and “Wild Oats,” the latter of which just started filming and is a comedy co-starring Christina Ricci, Shirley MacLaine and Bill Pullman. While Christopher is an excellent dramatic actor, I love to see him cut-up in a comedy, so “Wild Oats” is one I’m especially looking forward to. Q: I recently watched a movie called “The Last of the Dogmen,” starring Tom Berenger, and it got me to wondering what he’s been up to lately. — Mary W., Southbury, Conn.
A: Tom can be seen on the big screen — and in 3-D — in the summer blockbuster “Inception.” (FYI: So far, this is my favorite movie of the summer.) His movie “Sinners and Saints” also is touring the festival circuit. Q: One of my favorite reality shows is “The Real Housewives” series on Bravo. I especially love Bethenny Frankel on the New York series, and I wondered if that show and/or Bethenny would be back? — Michele M., Bel Air, Md. A: I spoke with Bethenny recently, and she told me she has no plans to return to the “Real Housewives.” In her words: “I very highly doubt I will go back to ‘Housewives.’ I don’t see any reason or upside for that.” Besides, Bethenny is pretty busy these days as a new mom, a newlywed and promoting her “Body by Bethenny” workout DVD. A: I am sad to report that I think yes, the dream might be over. Many fans, including myself, were drawn into the exciting series and had hoped that maybe TNT or AMC would save it from extinction. When I asked Lindsay about the possibility, she wasn’t super hopeful of a “FlashForward” resurrection. A: “Trauma,” a medical drama that centers on a group of paramedics in San Francisco, was officially canceled by the network this past May due to low ratings.